Our extremely popular evening dinner cruise takes in parts of both Upper and Lower Lough Erne. Sit back, relax and watch the sun go down while enjoying a refreshing drink from our fully licensed bar on board MV Kestrel. Your cruise departs from the 4-Star Killyhevlin Hotel, Enniskillen and takes you around the island of Enniskillen as far as Devenish Island where you can take in the spectacular views of Devenish Round Tower as you pass by the Island and turn to make the return journey back to the hotel. At the end of your cruise you will receive a warm greeting at the 4-Star Killyhevlin Hotel where your 3-course meal will be served at your leisure overlooking Lough Erne. 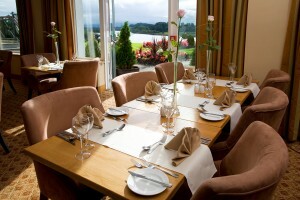 Choose from a selection of starters, main courses and desserts, followed by tea or coffee. Your meal is pre-ordered during your cruise to ensure efficient service on arrival back at the hotel. Food allergy advice is available. We can accept bookings right up until 12 noon on the day of the cruise. For groups of 10 or more credit card details will be required to secure the booking.